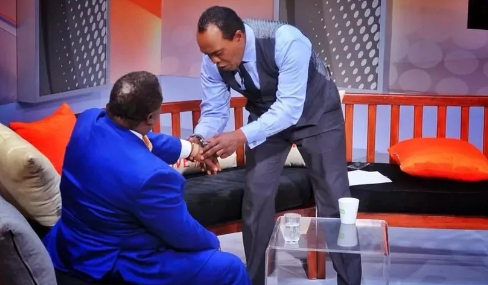 Citizen TV host Jeff Koinange has been warned by Media Council of Kenya (MCK) to stop questioning his interviewees about bedroom matters on Live TV. On Wednesday, the popular radio and TV presenter hosted Francis Atwoli and went on to inquire about his bedroom prowess. MCK believe the interview had obscene language that should not be on Live TV. “The interview kicked of at 9.49pm where Jeff started by asking Francis Atwoli to clear the air about his marriage with TV anchor. Atwoli confidently admits he is married to Mary Kilobi but the host goes ahead to ask questions touching on private aspects like age difference between the two and Atwoli’s performance in bed,” said David Omwoyo the CEO of MCK in a letter to Citizen TV. Omwoyo went on to warn him, in case he repeats it in the future sharing exactly what angered them. “The questions Lakini bado kazi unafanya, (You still perform well), Katiba bado unasoma (you still read the Constitution) and Kazi unaweza (You can manage the job) are repeated severally in the interview. At one point Atwoli dismisses Koinange reminding him it’s important to be cautious about disclosing private issues for the sake of his children and audience,” MCK said. “By this letter MCK wishes to inform you that it reserves the rightto take disciplinary action against the host of the programme and the media in view of the above contravened clauses. In the meantime urgently furnish the council with steps taken to avoid such occurrences in future,” MCK said.